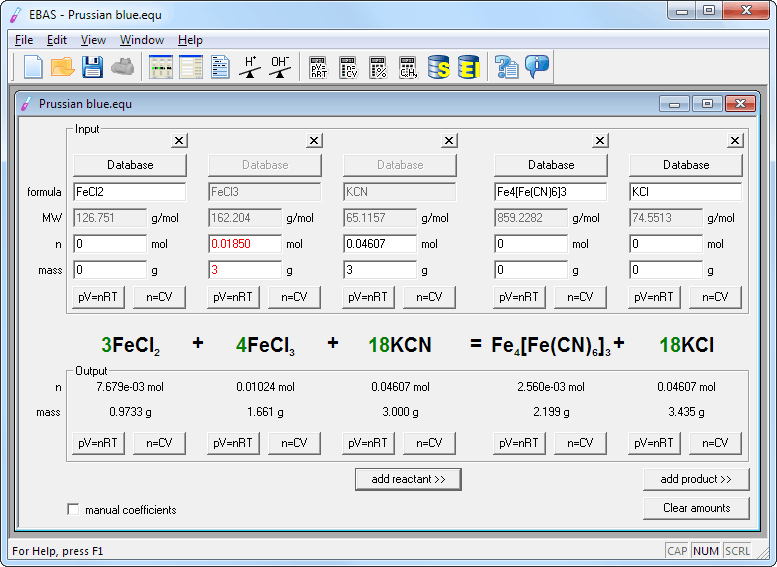 Once you are done with the screen shots, select balancing equations to learn how to use dialog windows shown here. This is the main program dialog - so called reaction view. 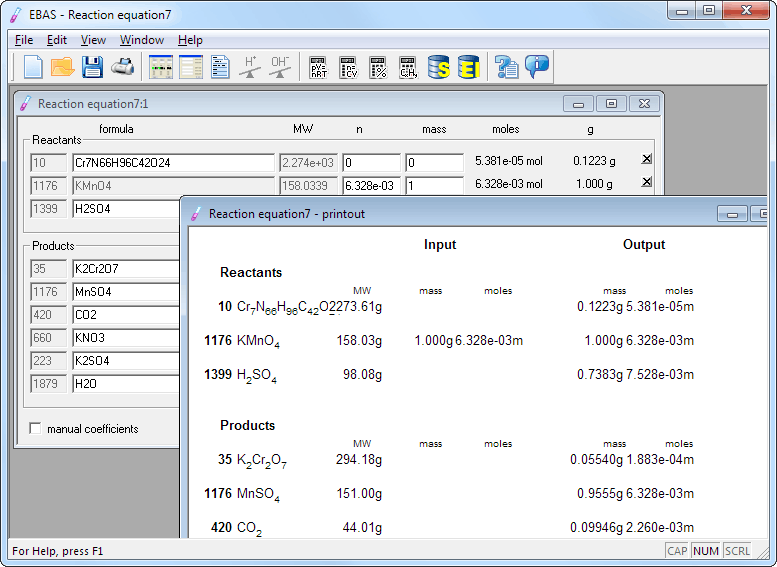 Size of the window (and number of reagents) can be changed using add reactant and add product buttons (or small crossed buttons above formula edit fields). Upper part of the window (input frame) is where you enter known information, bottom part (output frame) is where you read calculation results. Balanced chemical equation is displayed in the middle. Every column contains information about one reagent. If there are too many reagents and they don't fit the screen, you can use alternate user interface, shown on the third screen shot below. As you see program works with charged species as well as neutral molecules. While there is no support for oxidation numbers or half reactions, in most cases to balance redox reaction it is enough to balance charge in addition to mass balance, thus most redox reaction will be balanced. 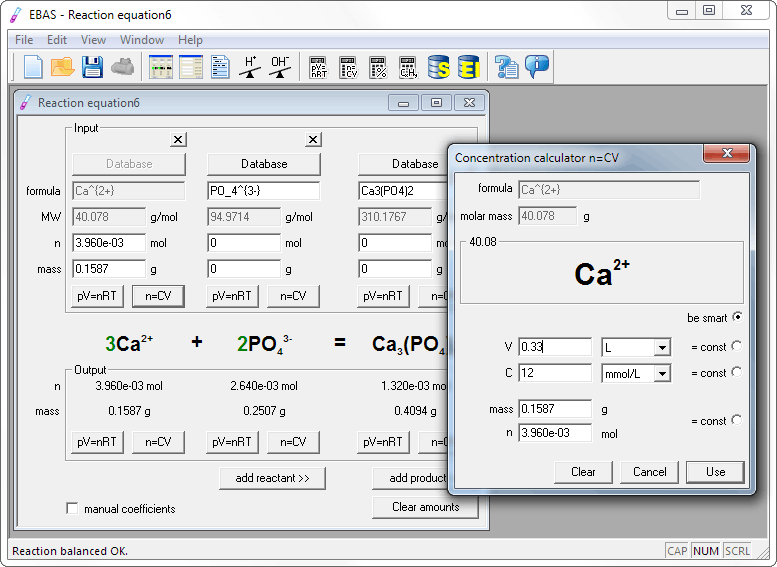 For calculation of amounts of substance present in solution aor in gaseous form, concentration and ideal gas calculators can be used. Alternate user interface and reaction summary printout. Alternate interface can be used whenever there are too many reagents and the standard view doesn't fit on the screen. This is only a fraction of program features, feel free to browse the site to see more, or to download the free 30-day trial to try EBAS by yourself. You may also download just EBAS help file in Windows chm format.